Anil Kakodkar is an eminent Indian nuclear scientist, and is the chairman of the Atomic Energy Commission of India and the Secretary to the Government of India, Department of Atomic Energy. He was born on 11 November, 1943. 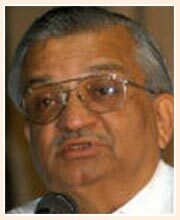 Kakodkar graduated from Ruparel College, Bombay University with a degree in Mechanical Engineering in 1963. He joined the Bhabha Atomic Research Centre (BARC) in 1964. He obtained a masters degree in experimental stress analysis from the University of Nottingham in 1969. In 1996, he became Director of the BARC and since 2000 he is leading the Atomic Energy Commission of India and also is the secretary of the Department of Atomic Energy. He has published over 250 scientific papers.